The performers finished in reverse order of the concert and everyone – the judges and I came up with the same results…no big surprises…4th Prize Andrew Rohwedder, 3rd Prize Janet Grohovac, 2nd Prize Chad Ibison and 1st Prize Adam Kossler. Congratulations all the way around! Most of the activity during the day on Saturday was the Youth Competition, offered for the first time this year. There were two divisions – one for students aged 11-14, and the second for students 15-18. So, Jr High & Senior High. Though it was not a public event, observers were allowed in to the Competition and as a teacher of students who are in that age range, I watched most of the performances. There are two reflections on this for me….one is students playing notes with absolutly no dynamics and no color changes. It is frustrating when you really DO emphasize this in lessons and yet in a performance the student doesn’t do it. Sometimes this can happen over and over again with students who get anxious about performing. In that case, I guess you count your blessings that they remembered all of the notes. The lesson for us as teachers, then, is to make sure we DO emphasize this in lessons. Well, really we must over-emphasize it. Probably even obsess on it a little. Begin each lesson w/ review of older pieces bringing more and more color and polish to the performance of it. Without this kind of consistent reminding, it doesn’t become natural and it doesn’t show up in their performances. The other thought is the dangers of allowing students to play pieces that are beyond their abilities. Many students did this in the older division. It was so frustrating to hear major works (like Tarrega’s Grand Solo) presented by students who were not able to even get a nice sound out of their guitars. Why not focus on less complex pieces played with correct notes, all notes clear and a nice, full sound? 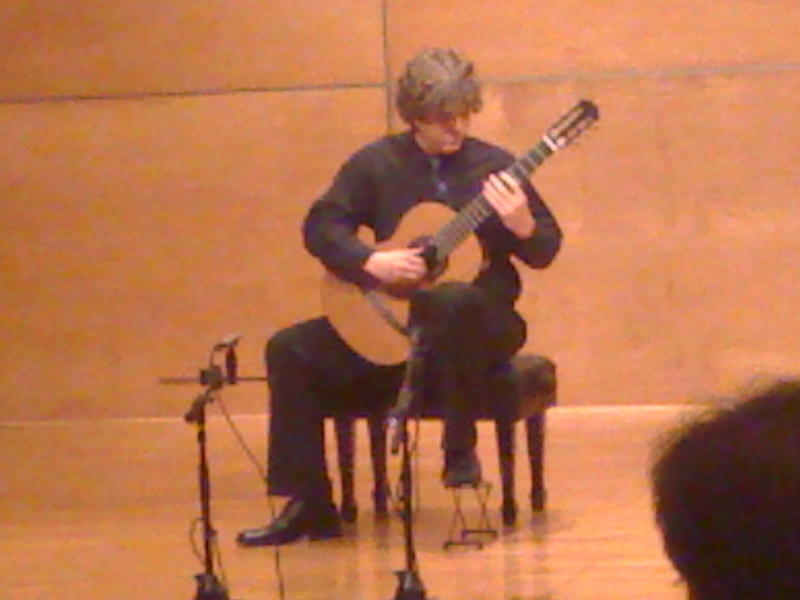 One boy performed Dyens’ ‘Tango en Skai’ Each and every time a certain run was played which involved significant shifting, he made no real attempt to play each note individually. It was the get-my-hand-in-the-general-area-while-moving-my-fingers-and-at-least-play the highest-note approach. Argh. It was so frustrating to watch. At least the younger kids were (mostly) getting the notes. Some of the older kids displayed a certain arrogant swagger at the fact that they were ‘performing’ such hard pieces. Let’s not be guilty of this, teachers….!!!!! If the students get enough of the basics – like playing correct notes with a beautiful sound and exaggerated dynamics – soon enough they’ll be able to take on the more difficult pieces and really get the job done. And they’ll be hooked for life. And that’s much more fun and satisfying….for them and for us. Roux with style and skill. Already on ‘Classical Guitar Blog’ today I saw the declaration that it was the best classical guitar concert the author has ever seen. In Conclusion, it was a great weekend of performances and classes! Thanks to UT Dallas for all the hard work and dedication involved in this Festival every year. 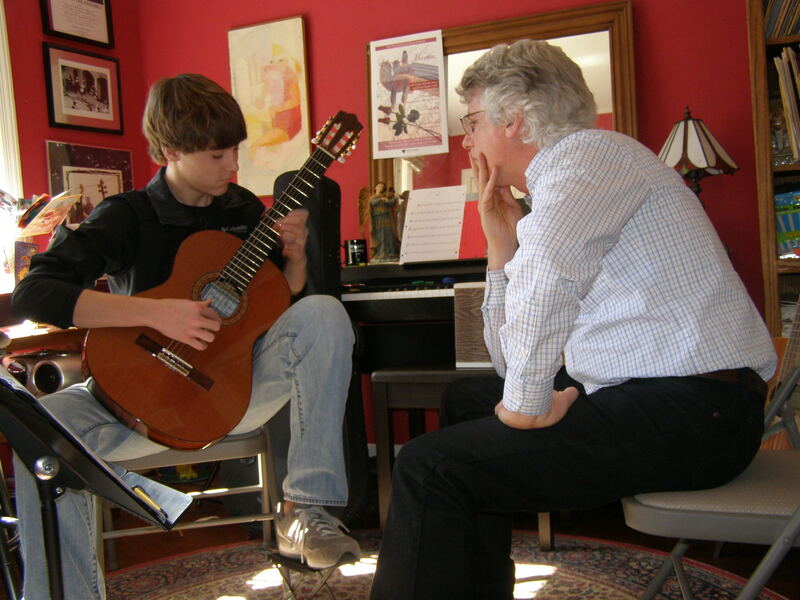 Friday and Saturday have been great for observing some wonderful guitar lessons! Friday evening brought more guitar shop-talk on the nuts and bolts of teaching the pieces Canarios and the Cimarosa Bmi Sonata. Saturday – my last full day here! Got together with Joe Pecoraro to observe some High School kids’ lessons and have lunch. 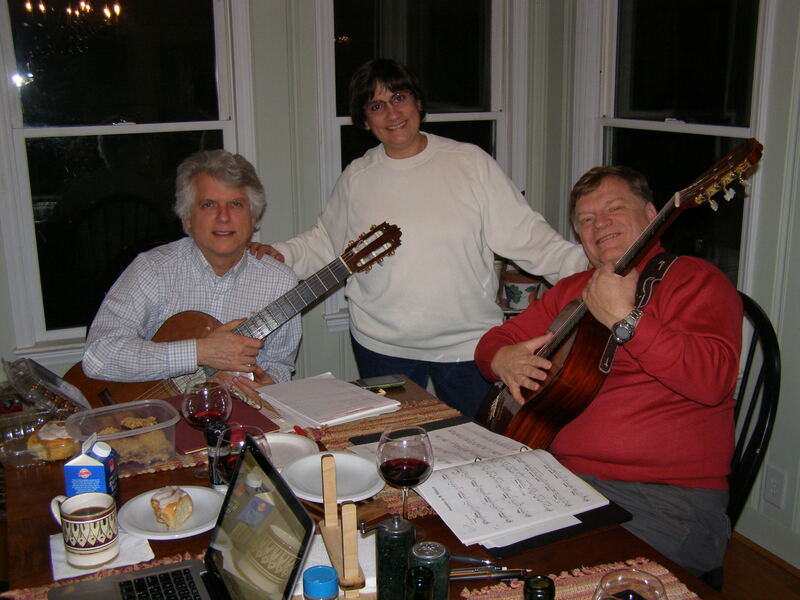 Joe and his wife have two young sons who are both budding guitar virtuosos!! Also got to watch some lessons at Bill’s studio. Later, dinner and more discussion of pieces at Ken’s house. His younger students really like that LUCKY DUCKS game. 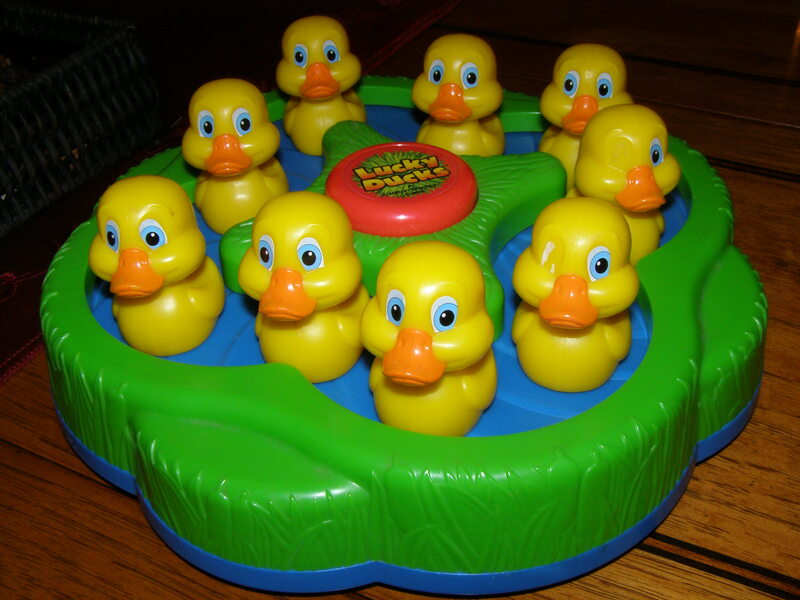 He’s put numbers on the bottom of the ducks to represent pieces in their repertoire. They draw 5 and then play thru their review. Cute!! On my way home tomorrow night…. Guitars and Pets in N.C. 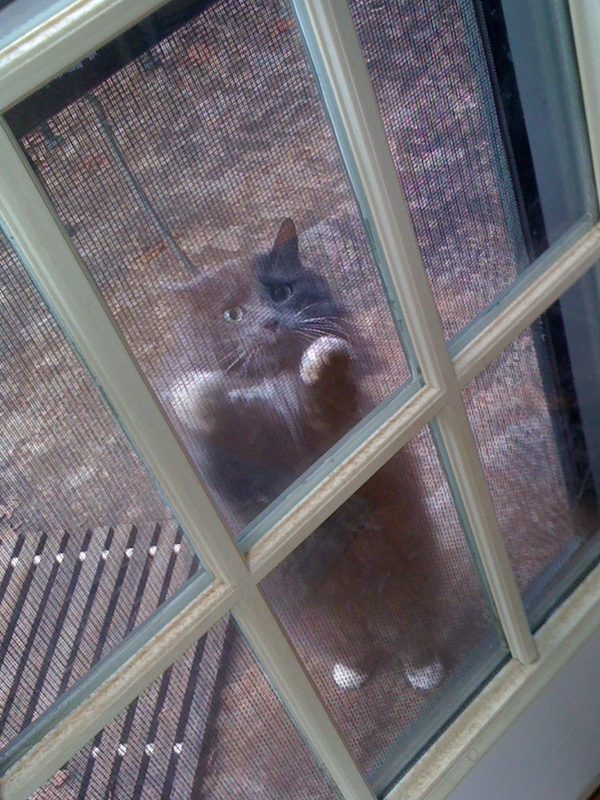 Here's the kitty who doesn't understand why she can't come in. Tuesday dawned with the kitty meowing outside…she doesn’t understand why she can’t come in and who is this new guest in the house. And Mark, the dog, doesn’t get it, either. 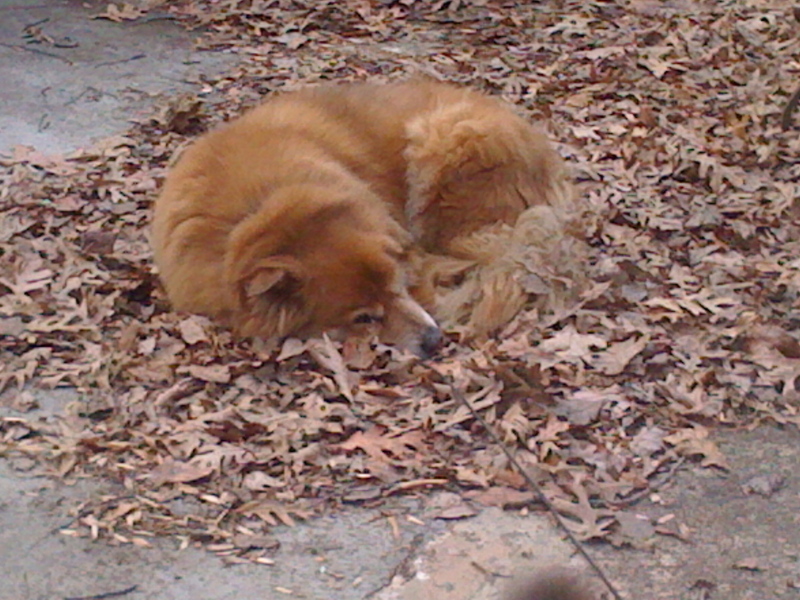 He makes himself comfortable on the patio, on a bed of leaves. Here's Mark in his new bed. 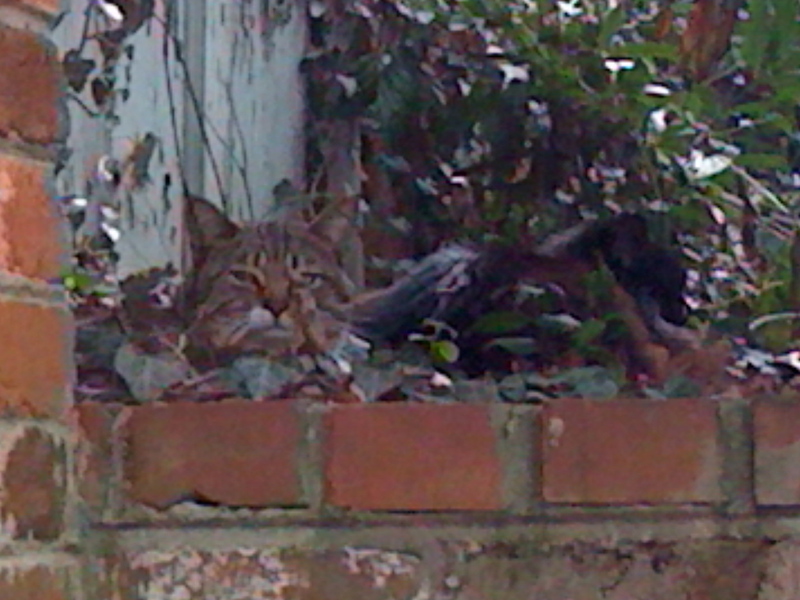 I do feel guilty over the displacement of the pets, but very happy to have this good opportunity. So far I’ve observed in three studios – Ken Wilson and Bill Kossler, who both teach independently in Winston-Salem and Joseph Pecoraro at the North Carolina School of the Arts. Every teacher has great ideas which are really valuable to see. 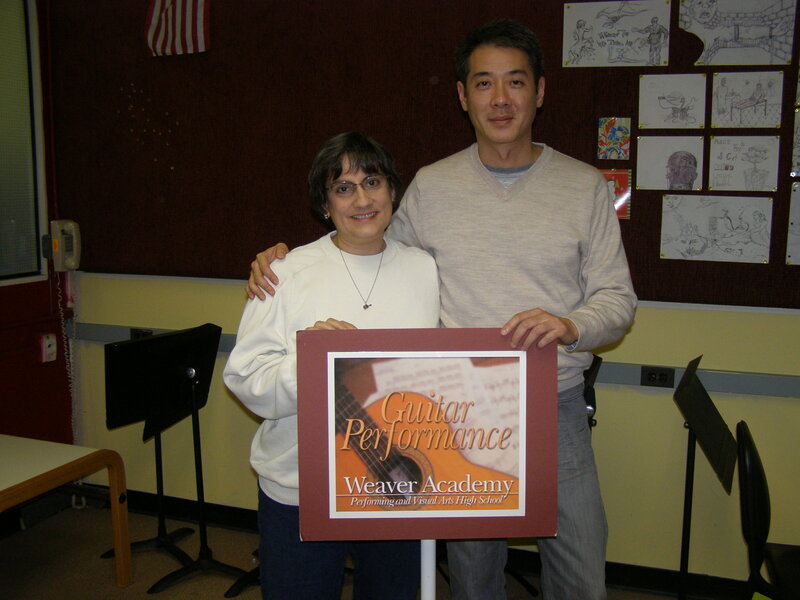 Ken has his students play a song by ear every week in addition to reading and repertoire. Bill is getting each student set up with a binder and dividers. In the front section is the stuff they need to practice every day. In the back sections they can skip around as long as they cover everything in a week. Pretty organized and it makes it easy to choose what to listen to in a lesson. Joe has a ton of great ideas he uses with his students both at the high school and college level. He chooses simple etudes from old Shearer Books which are easy to memorize. Because they are so solid, he uses them to work fine points of left and right hand technical focus in an amazing, detailed way. Lauren plays violin in the symphony and Tuesday was the Final Performance of ‘Midsummer Night’s Dream’ in partnership with the Drama Dept of the School of the Arts. It was such an enjoyable performance and really funny. It was held at the Stevens Center in Winston-Salem and it was the first time I’ve been able to get the check-in feature to work for me on Facebook. Woo-hooooo!! 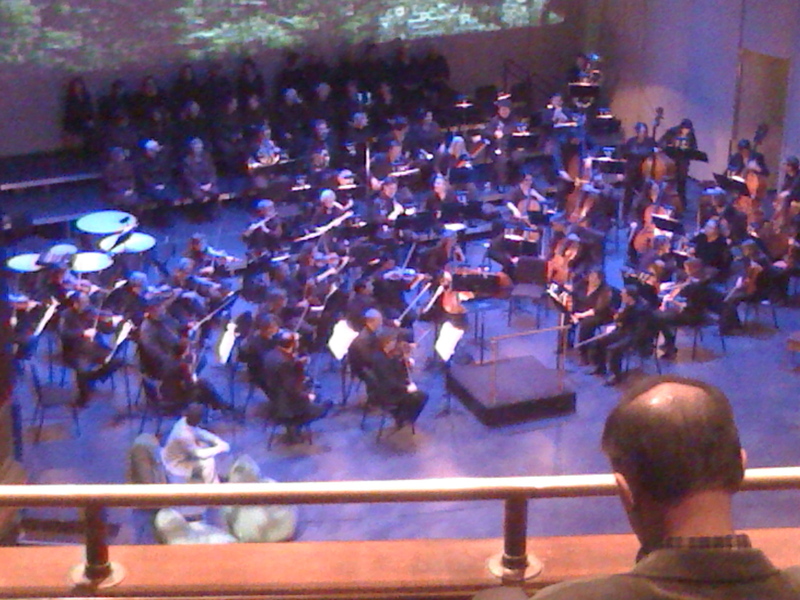 Today, Wednesday, saw a Facebook Check-in at the North Carolina School of the Arts again to watch some more lessons. It is really amazing how good those high school students are. They play pieces which are quite advanced and with a great deal of confidence. Gotta hand it to those great instructors! 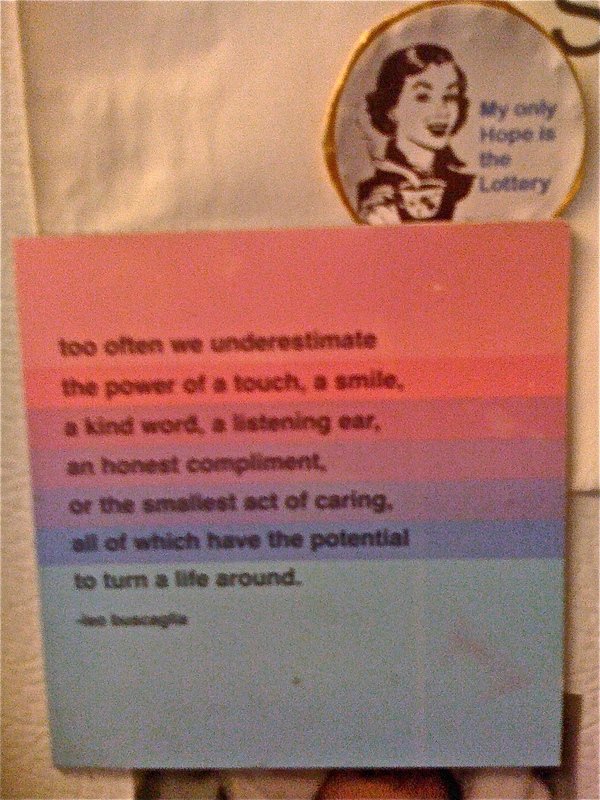 You might enjoy the inspiring poetry posted on the Kossler’s Fridge….. and perhaps the contrasting messages will strike you funny, as they did me…!